The French movie La chambre des officiers aka The Officers’ Ward may very well be one of the most moving and shocking war movies I have ever seen. I felt sick twice, I cringed endlessly and it made me really sad. It is a masterpiece. An absolutely brilliant anti-war movie. If you thought Born on the 4th of July was horrible then you haven’t seen this one. 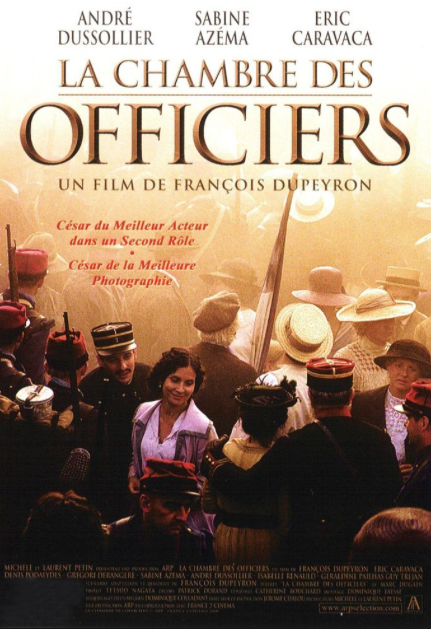 The movie is based on Marc Dugain’s novel La chambre des officiers aka The officers’ ward and tells the story of the young lieutenant Adrien. At the beginning of WWI Adrien is a very handsome young officer. A piece of shrapnel rips half his jaw off. He will spend the rest of the war, a full five years, at the Val-de-Grâce Hospital in Paris. At this hospital they only cure men with facial wounds, burns etc. It is like a freak show only these are human beings. During the five years at the hospital he fights great pain, despair, horror, suicidal thoughts. Together with the other mutilated officers they try to stay alive and become human beings again. The music is very intense (Arvo Pärt and Wagner, admittedly the second is a bit strange) and underlines the atmosphere of this saddest of war movies. Funny enough there is also beauty. The beauty in the relationships between the wounded. And the beauty between Adrien and a very gentle and loving nurse. There is also a brothel scene towards the end that is not only lighter in tone but even in a melancholic way funny. This is a very thought-provoking, must-see, 5/5 star movie. I only found the French trailer, I’m sorry. This entry was posted in France, Movie, Nurses in War Movies, Reviews, Trailer, War Movie, Women in War Movies, WWI and tagged French Movies, La chambre des officiers, Marc Dugain, Movie Trailer, Movies, Mutilation, Nurses in War Movies, Reviews, The officers' ward, Val-de-Grâce Hospital, War Movies, Women in War Movies, WWI. There are suppose to be some good movies about the conflict France was in in Algeria, I don’t know if you have reviewed any of those. A friend from neighbouring Tunisia told me that was a real bad war and everything else seems to indicate that too though I don’t know much about it. I have reviewed Intimate Ennemies. Yes, it was avery bad war. I do unfortunately know a lot about it as my father is an Algeria veteran. I wrote about it in my About page and on the post of Intimate Ennemies. A truly ugly war. There are more movies about Algeria, the most famous being La battaglia di Algeri that is obviously Italian/Algerian.